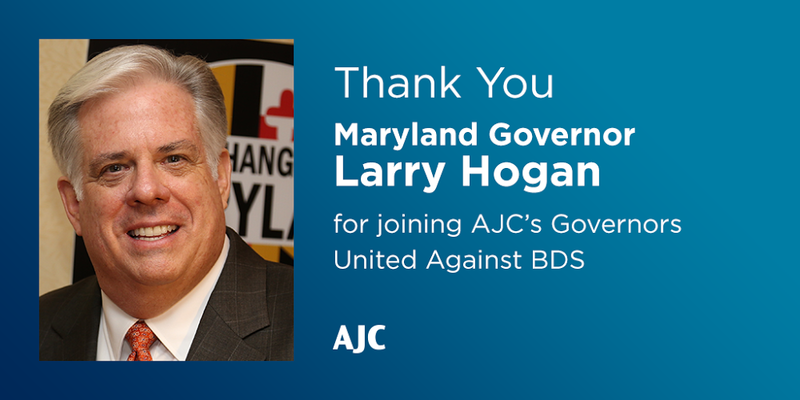 Maryland Governor Larry Hogan has taken a firm stance in opposition to BDS. Image via AJC. Maryland Governor Larry Hogan will be traveling to Israel next week for a series of widely-publicized business meetings. What has not yet been reported is that Maryland and Israel will be forming a Sister State relationship with Israel. I spoke with Bonnie Glick, the Chair of the Maryland-Israel Sister State Committee, to get a glimpse at the planning that went into this momentous diplomatic step for Maryland. Maryland’s Sister State will be the Negev, in Israel’s south, which is the home of much of their high tech industry. The Sister States Program relies on an extensive structure of representative volunteer committees for each Sister State relationship and draws upon the expertise and experience of individuals from institutions, businesses, and organizations across Maryland. When added to their overseas counterparts, these committees form a powerful network both at home and abroad for fostering public/private cross-fertilization and social and economic growth. Sister States relationships are significant in an age in which state and regional governments have an increasingly greater role in events. By giving access to policy makers, the people-to-people contacts of the Sister States Program add a human dimension to governmental interaction. They help to create a friendly and receptive climate for developing multi-faceted ties in today’s closely integrated but highly competitive environment. What started this process for you in terms of establishing a sister-state relationship with Israel? When Governor Hogan was campaigning, he said that one of the first trips he planned to take, if elected, was to Israel. As we all know, he was diagnosed with Stage 3 Non-Hodgkins lymphoma after his first international trip to Asia. He determined that his next trip, once he was healthy again, would be to Israel. While previous governors have traveled to Israel, not a single one established a Sister State relationship with any part of Israel. Governor Hogan and his Secretary of State, John Wobensmith, determined that a Sister State relationship with the Negev Region was a wise partnering for our state. I’m puzzled that no previous governor took this step as there are strong business connections between Maryland companies and Israeli companies. Governor Hogan, however, has proven (again) what a great leader he is by establishing this important relationship as well as by categorically opposing BDS moves against Israel. His strong and abiding support for Israel were critical components to making the Sister State relationship a success. The idea of a Sister State relationship is to serve as a force multiplier for the good work that is already being done between Maryland and her Sister State partners. What does it mean to be a Sister State with Maryland? Maryland had seventeen formal Sister State relationships. This one will be the eighteenth. Maryland has been partnering with regions around the world, with the first relationship established with a region in China over 40 years ago. This longstanding custom serves to highlight Maryland as a global state, one in which our population is aware of the world and engages with it. The benefits that accrue to both sides are quantifiable in terms of contacts made, collaborative research undertaken, businesses brokered, and problems solved. Adding the Negev region of Israel to the long list of successful Sister States is a great move by Governor Hogan. Why was the Negev Region in Israel ultimately chosen? The Negev region was suggested to the Maryland Sister State Committee because it has strong business, education, and cultural similarities with our state. The Negev is the headquarters area for Israel’s cyber command, as Maryland is the headquarters of our National Security Agency. The Negev has “bloomed,” agriculture flourishes there, and Maryland believes that our occasional water droughts may be mitigated by learning from Negev-region professors, particularly those associated with Ben Gurion University. Maryland and the Negev region boast world-class universities – our very own University of MD, Johns Hopkins University, and other faculties collaborate with colleagues and academics around the world – just as faculty from Ben Gurion University and Israel’s other world class universities do. We expect that our regions will collaborate in important scientific research around water, health, and more. We also hope to exchange visits in areas of sports, culture, and education. A representative from the Israel Tennis Centers which sends coaches and players to Maryland (including to the Charles E. Smith Jewish Day School, where my son is a student) will be meeting with us in Israel. Business, science, cybersecurity, education, sports, and culture are all areas for collaboration for Maryland and the Negev. What benefits do you see this having for Maryland? Maryland and Israel will share knowledge, culture, and business ties. Larry Hogan’s signature line for our state is that Maryland is open for business. That business, in the case of the Sister State relationship and anti-BDS position of the governor, can come from Israel which is also known as the Start Up Nation. What benefits do you see this having for Israel? A Sister State relationship is a bilateral relationship, with both sides benefiting and both sides contributing. When we have a signed Memorandum of Understanding between Maryland and the Negev Region, we can begin, in earnest, to exchange the best ideas that both regions have to offer. Collaboration internationally will lead to economic and social ties across the globe. What else will Governor Hogan be doing while in Israel? Governor Hogan will be traveling with four members of his Cabinet, the Secretary of State, the Secretary of Transportation, the Secretary of Commerce, and the Secretary of Aging. During the visit he will also view historic sites, including those that are important to Christians. The Governor is Catholic and he will visit holy sites in Jerusalem and around Israel. We hope that he will have a chance to meet with Prime Minister Netanyahu if the two are in the country at the same time. Prime Minister Netanyahu will be in the US for most of Governor Hogan’s visit for the UN General Assembly. The Governor also plans to meet with Terps in Israel – graduates of the University of Maryland who represent our state well all over the world. Previous Previous post: Is a Beer the Solution to 2016’s Truth Problem? I represent Chicago's Fifth Ward as its Ward Committeeman and The University of Chicago's College Republicans as its President. As a grassroots conservative activist who has worked on campaigns from Alaska to Indiana to Massachusetts to Illinois to Maryland, I have been featured in various outlets, from The Jerusalem Post to On the Record with Greta Van Susteren, and am consistently engaged in local, state, and national conservative causes. Never one to shy away from a challenge, any candidate should feel free to contact me for help — in the digital age, no part of the country is too far out of reach for our message. You can find me on Twitter @MatthewFoldi with questions, criticisms, or anything in between. Be the first to get content from An Elephant In The Woods by leaving your email here! Leave your email here to be the first to get the newest posts! I Want Content Before Anyone Else!